The Ku band (/ˌkeɪˈjuː/) is the portion of the electromagnetic spectrum in the microwave range of frequencies from 12 to 18 gigahertz (GHz). The symbol is short for "K-under" (originally German: Kurz-unten), because it is the lower part of the original NATO K band, which was split into three bands (Ku, K, and Ka) because of the presence of the atmospheric water vapor resonance peak at 22.24 GHz, (1.35 cm) which made the center unusable for long range transmission. In radar applications, it ranges from 12-18 GHz according to the formal definition of radar frequency band nomenclature in IEEE Standard 521-2002. Ku band is primarily used for satellite communications, most notably the downlink used by direct broadcast satellites to broadcast satellite television, and for specific applications such as NASA's Tracking Data Relay Satellite used for both space shuttle and International Space Station (ISS) communications. Ku band satellites are also used for backhauls and particularly for satellite from remote locations back to a television network's studio for editing and broadcasting. The band is split by the International Telecommunication Union (ITU) into multiple segments that vary by geographical region. NBC was the first television network to uplink a majority of its affiliate feeds via Ku band in 1983. Some frequencies in this radio band are employed in radar guns used by law enforcement to detect vehicles speeding, especially in Europe. One use of the band is direct-broadcast satellite television. A satellite dish on a residence, which receives satellite television channels over a Ku band microwave beam from a broadcast communications satellite in a geostationary orbit 35,700 kilometres (22,000 miles) above the Earth. Segments in most of North and South America are represented by ITU Region 2 from 11.7 to 12.2 GHz (Local Oscillator Frequency (LOF) 10.75 to 11.25 GHz), allocated to the FSS (fixed satellite service), uplink from 14.0 to 14.5 GHz. There are more than 22 FSS Ku band satellites orbiting over North America, each carrying 12 to 48 transponders, 20 to 120 watts per transponder, and requiring a 0.8-m to 1.5-m antenna for clear reception. The 12.2 to 12.7 GHz (LOF 11.25 to 11.75 GHz) segment is allocated to the BSS (broadcasting satellite service). BSS (DBS direct broadcast satellites) normally carry 16 to 32 transponders of 27 MHz bandwidth running at 100 to 240 watts of power, allowing the use of receiver antennas as small as 18 inches (450 mm). Segments in those regions are represented by ITU Region 1 and they are, the 11.45 to 11.7 and 12.5 to 12.75 GHz bands are allocated to the FSS (fixed satellite service, uplink 14.0 to 14.5 GHz). In Europe Ku band is used from 10.7 to 12.75 GHz (LOF Low 9.750 GHz, LOF High 10.750 GHz) for direct broadcast satellite services such as those carried by the Astra satellites. The 11.7 to 12.5 GHz segment is allocated to the BSS (broadcasting satellite service). The ITU has categorized Indonesia as Region P, countries with very high rain precipitation. This statement has made many people unsure about using Ku-band (11 – 18 GHz) in Indonesia. If frequencies higher than 10 GHz are used in a heavy rain area, a decrease in communication availability results. This problem can be solved by using an appropriate link budget when designing the wireless communication link. Higher power can overcome the loss to rain fade. The use of the Ku-band for satellite communications in tropical regions like Indonesia is becoming more frequent. Several satellites above Indonesia have Ku-band transponders, and even Ka band transponders. Newskies (NSS 6), launched in December 2002 and positioned at 95° East, contains only Ku-band transponders with a footprint on Indonesia (Sumatra, Java, Borneo, Celebes, Bali, Nusa Tenggara, Moluccas). NSS 6 is intended to be replaced by SES-12 at the same location, which launched in June 2018 and carries 54 Ku-band transponders. The iPSTAR satellite, launched in 2004 also uses Ku band footprints. Other satellites that provides Ku band covers Indonesia are Palapa D, MEASAT 3/3A, JCSAT-4B, AsiaSat 5, ST 2, Chinasat 11, Korea Telecom Koreasat 8/ABS 2 (2nd half 2013), and SES-8. Other ITU allocations have been made within the Ku band to the fixed service (microwave towers), radio astronomy service, space research service, mobile service, mobile satellite service, radiolocation service (radar), amateur radio service, and radionavigation. However, not all of these services are actually operating in this band and others are only minor users. Compared with C-band, Ku band is not similarly restricted in power to avoid interference with terrestrial microwave systems, and the power of its uplinks and downlinks can be increased. This higher power also translates into smaller receiving dishes and points out a generalization between a satellite's transmission and a dish's size. As the power increases, the size of an antenna's dish will decrease. [page needed] This is because the purpose of the dish element of the antenna is to collect the incident waves over an area and focus them all onto the antenna's actual receiving element, mounted in front of the dish (and pointed back towards its face); if the waves are more intense, fewer of them need to be collected to achieve the same intensity at the receiving element. A major attraction of the band over lower frequency microwave bands is that the shorter wavelengths allow sufficient angular resolution to separate the signals of different communication satellites to be achieved with smaller terrestrial parabolic antennas. From the Rayleigh criterion, the diameter of a parabolic dish required to create a radiation pattern with a given angular beamwidth (gain) is proportional to the wavelength, and thus inversely proportional to the frequency. At 12 GHz a 1-meter dish is capable of focusing on one satellite while sufficiently rejecting the signal from another satellite only 2 degrees away. This is important because satellites in FSS (Fixed Satellite Service) service (11.7-12.2 GHz in the U.S.) are only 2 degrees apart. At 4 GHz (C-band) a 3-meter dish is required to achieve this narrow angular resolution. Note the inverse linear correlation between dish size and frequency. For Ku satellites in DBS (Direct Broadcast Satellite) service (12.2-12.7 GHz in the U.S.) dishes much smaller than 1-meter can be used because those satellites are spaced 9 degrees apart. 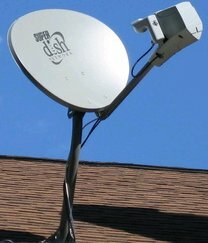 As power levels on both C and Ku band satellites have increased over the years, dish beam-width has become much more critical than gain. There are, however, some disadvantages of Ku band system. Around 10 GHz is the absorption peak due to orientation relaxation of molecules in liquid water. Above 10 GHz, Mie scattering takes over. The effect is a noticeable degradation, commonly known as rain fade, at heavy rain (100 mm/h). This problem can be mitigated, however, by deploying an appropriate link-budget strategy when designing the satellite network, and allocating a higher power consumption to compensate rain fade loss. Therefore, the Ku band satellites typically require considerably more power to transmit than the C-band satellites. ^ Note that in the band 11.2–12 GHz the working definitions of Ku band and X band overlap; satellite communications engineers would generally regard frequencies above 11.2 GHz as being part of the Ku band. ^ "Radiocommunications (Communication with Space Object) Class Licence 1998". Federal Register of Legislation. Australian Government. 2012-03-21. Retrieved 2016-07-06. ^ Martin Chaplin: Water and Microwaves. Frequency allocation information, mostly for U.S.